USADA announced today that Shaun Moffett, of San Antonio, Texas, an athlete in the sport of cycling, has accepted an additional three-month sanction and had his results disqualified for competing while ineligible. Moffett, 39, initially accepted a 21-month period of ineligibility and loss of results in April 2018 after a sample he provided during an out-of-competition test was positive for a prohibited Hormone and Metabolic Modulator. The announcement regarding Moffett’s initial violation can be found here. Despite serving a period of ineligibility which prohibits Moffett from participating in any capacity in a competition or activity authorized or organized by an organization like USA Cycling, Moffett went on to participate in the McAllister Park Summer Speed Series event on August 12, 2018, which was sanctioned by USA Cycling, thereby violating the terms of his sanction. Upon investigating the circumstances of the violation, USADA concluded that Moffett was operating under the mistaken belief that he was eligible to participate in the event because it was non-competitive and he did not need a USA Cycling license to participate. 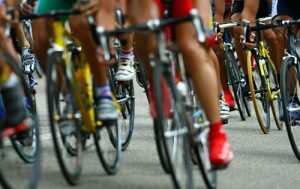 USADA concluded that an additional period of ineligibility was warranted due to the readily available information indicating the event was sanctioned by USA Cycling. Moffett accepted an additional three-month period of ineligibility, meaning his original 21-month period of ineligibility beginning on December 6, 2017 has been increased to a 24-month period of ineligibility. Furthermore, Moffett has been disqualified from all competitive results obtained on and subsequent to August 12, 2018, the date he participated while ineligible, including forfeiture of any medals, points and prizes.